THIS Father’s Day, many dads will be making room for the latest obligatory pair of socks, driving gloves or comedy tie. However, doting sons and daughters can say ‘thanks’ in true Scottish style with the range of dram-tastic gift options at The Scotch Whisky Experience. 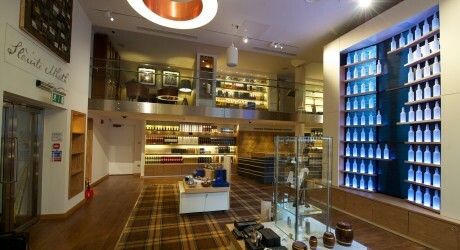 The award-winning Edinburgh visitor attraction offers something for every difficult-to-buy-for dad, from a novice introduction to the celebrated world of whisky, to a connoisseur’s masterclass for the more seasoned whisky drinker. The Silver Tour is the perfect introduction to Scotland’s national drink, exploring its history and heritage and giving a flavour of the skill and expertise behind the country’s £4.5bn Scotch Whisky industry. The tour features a bubbling barrel ride in which visitors become part of the whisky making process through a replica distillery, an introduction to the aromas of whisky and a tutored tasting, and the opportunity to view the world’s largest collection of Scotch Whisky. Housed in a custom-made glass and marble vault, with a Swarovski crystal chandelier, the record breaking collection comprises almost 3,500 bottles. Meanwhile, the Morning Masterclass allows malt maniacs to get up close and personal with a carefully chosen selection of malt, blended and single grain whiskies, and take their tasting technique up a gear. The one-and-a-half hour masterclass includes a private viewing of the whisky collection, an interactive sensory perception test and the rare opportunity to nose new-make spirit. The experience also includes tea/coffee and shortbread, a boxed crystal whisky tasting glass and a copy of the prestigious Whisky Magazine. Having had their taste buds tantalised, dads can then take a taste of their Father’s Day experience home – quite literally. Expert whisky advisors are on-hand in the newly renovated retail experience to offer tailored guidance on the buying the perfect bottle of malt. With more than 300 bottles of single malt, grain and blended scotch whiskies available, there is bound to be a bottle to suit any taste. In addition, both gift options also include a discount voucher, which can be redeemed off the price of a bottle in the shop. Silver Tour – runs daily from 10:20am to 5pm (5:30pm on Saturday and Sunday) and lasts for approximately one hour. Adult £12.50/Concession £10/Children (6-17 years) £6.50/Family (two adults and two children) £30. Advance tickets are valid for one year. Morning Masterclass – runs Monday to Friday at 10am, priced at £25 per person. Advance tickets are valid for one year.